Self-chosen activities within the classroom—from art, blocks, manipulatives, science, library, dramatic play and music (approximately 1 hour). 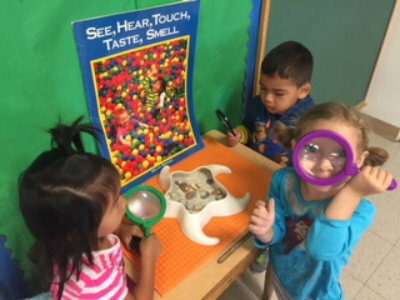 Discovery Time’s purpose is to empower children to choose from a wide variety of activities designed to spark their curiosity, build skills, and support interest. Teachers support children as they develop initiative in choosing activities, gain independence in doing the activities, move toward cooperative and socio-dramatic play, and develop a fascination for letters, numbers and counting, colors and art media, shapes, and more. Skills gained during this time include an increasing attention span, learning to take turns, developing the fine muscles of the hand in preparation of writing, working on hand-eye coordination, and increasing conversation skills.